I love this time of year. Have you guessed I really like Christmas yet? One of my favourite things about this time of year is the food. It's not a time to be worrying about how much you eat, as long as you don't overdo it - a little bit of everyone does you good, right? I love trying out new ideas and was inspired by an image of a Chelsea Bun Christmas Tree for this recipe. 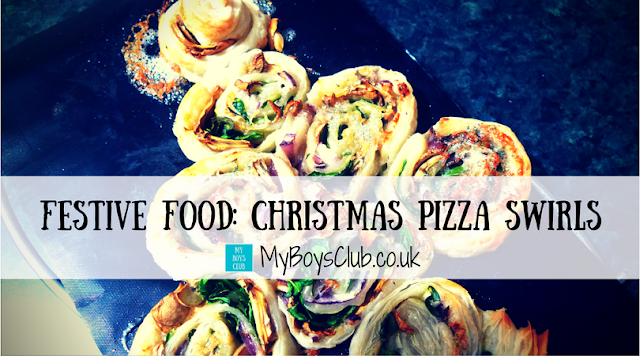 However, it's not Chelsea Buns but Pizza Swirls, made out of ready rolled puff pastry, that are creating my foodie Christmas Tree this year. So what's a Pizza Swirl? I saw a recipe on Pizza Swirls on the Feeding Boys blog and have been making them for my boy's packed lunches at school, however, I fancied a more grown up version for my tree. I know it's not to everyone's taste but I adore blue cheese. The combination of blue cheese with red onion, mushroom and fresh spinach to me was going to be a winner. 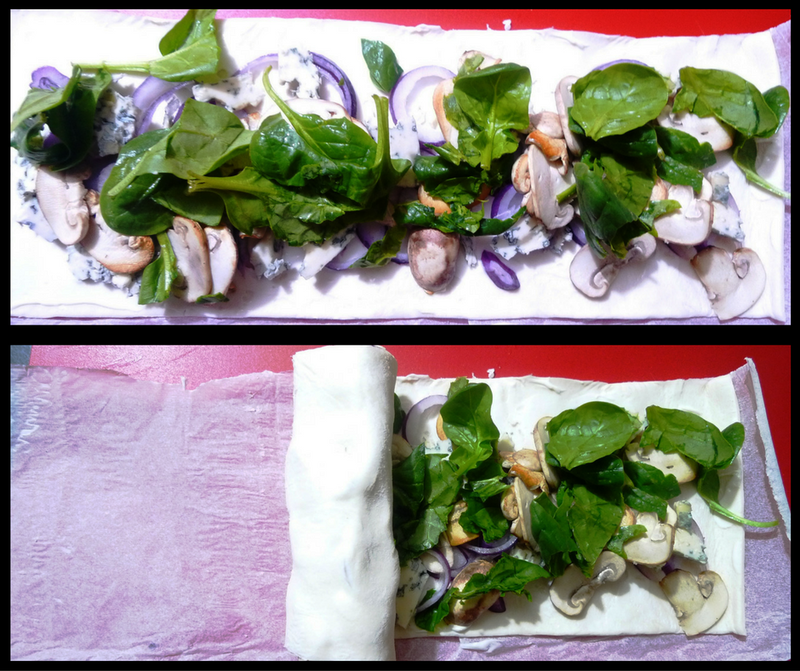 Fairly classic, I can easily see it actually topping a pizza, but with a Pizza Swirl it runs through the middle - a bit like a swiss roll. 2. 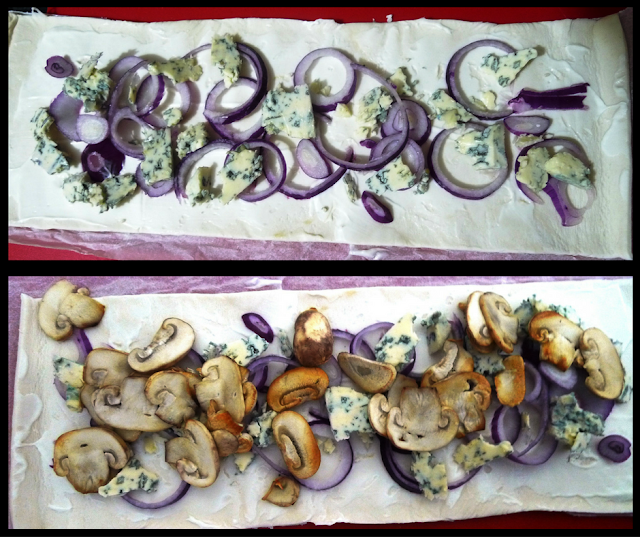 Unroll the sheet of puff pastry and spread evenly with a layer of the sliced red onion. 3. Then crumble the blue cheese over the onion, before topping with the chopped mushrooms and spinach. 5. Place the slices on the baking sheet. For our usual pizza swirls, you want to keep them, apart however for the Christmas Tree you need to place them in the shape of a tree, close together so there are no gaps in between. It really is that easy and the filling was so tasty. My next combination to try is going to be brie or camembert with cranberry and then maybe a sweet filling of coffee and walnuts. If you are having a family gathering or celebrating with friends this festive season why not try a making a Pizza Swirl Christmas Tree?